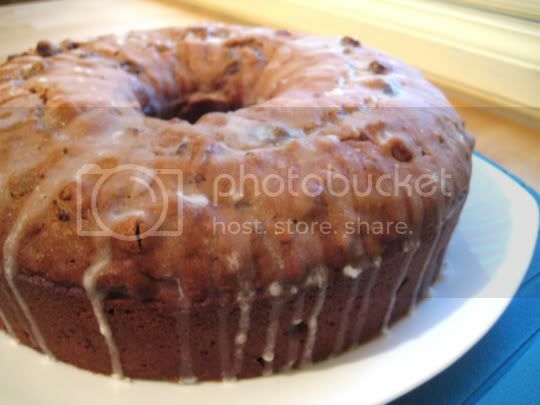 An amazing, dense, moist spice-filled cake, chockful of plump raisins and chopped pecans, and topped with a mouthwatering lemony-sugary glaze...wow, it's hard to believe this cake is vegan! That's right, no eggs or dairy products are used in this "healthy" dessert, but its moistness and perfect texture (and of course flavor) makes that seem almost impossible! This delightful dessert (well, I had slices for breakfast) was also super easy to make. It's your basic wet-dry ingredient preparation, except all the "wet" ingredients are boiled together. Imagine the aroma of sugar, raisins, cinnamon, nutmeg, and cloves all simmering together, and then imagine the flavor results! Even the raisins are plumped up and extra juicy thanks to this step. Margarine (make sure it's vegan for a truly vegan cake) is then melted into the sugar-spice mixture, so you get an extra buttery flavor. This baked for about 10-15 minutes longer than the suggested time (but your nose will thank you!). A couple notes about the glaze. The amount of 2/3 cup lemon juice and 3 cups confectioners' sugar is ENTIRELY TOO MUCH. This amount should be halved, or maybe even quartered. The glaze is not to be spread on the entire cake, but rather heavily drizzled...and the amount is STILL too much. I ended up pouring most of the excess down the drain. Also, the juice-sugar ratio doesn't seem quite right. The glaze turned out extremely liquidy. I would lessen the lemon juice amount next time drastically. The flavor was still amazing - tart and sweet - but I'm mad I used an entire box of sugar and bag of lemons! Make again? Definitely. This would be great for the holidays. This Boiled Spice Cake was good. I really enjoyed the lemony flavor. My mother is vegan, so I will surprise her with this delicious treat.